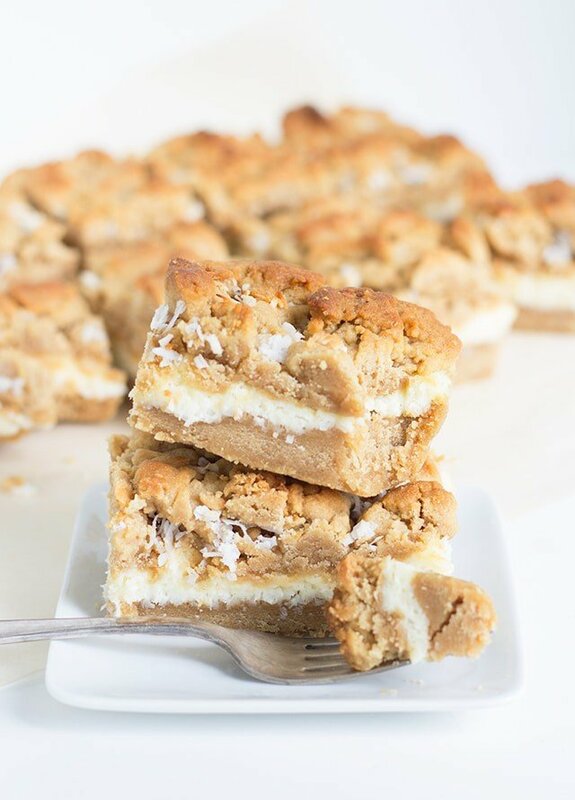 Dense, chewy peanut butter bars with a thick layer of coconut cheesecake filling are the perfect dessert. Another month has passed and it’s time for the Peanut Butter Bash again! 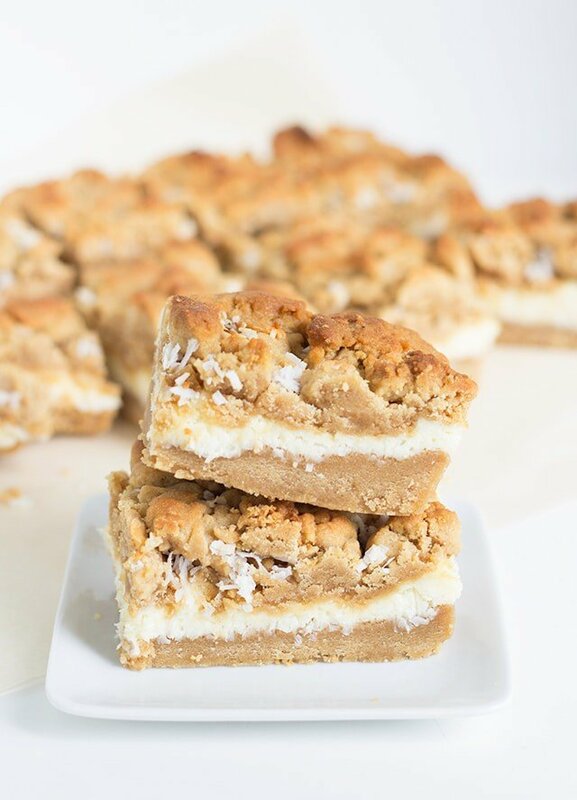 This month’s theme is peanut butter and coconut, so what better thing to make than these peanut butter coconut cheesecake bars. 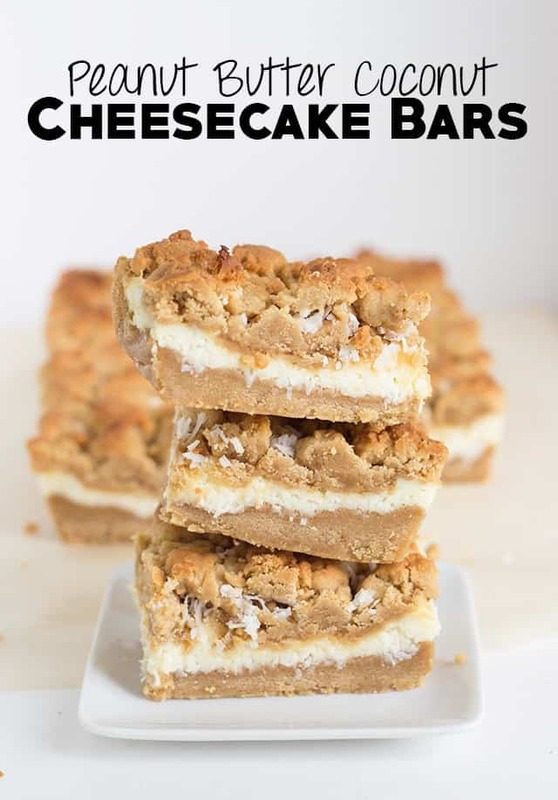 They’re similar to my peanut butter chocolate chip cheesecake bars, but very different in flavor. These have the tropical feel to them. Quite summery! My hubby isn’t a coconut fan, but he fell for these bars. I knew I could win him over. Peanut butter is his weakness. Mine too, obviously. That’s why I have the Peanut Butter Bash. I can’t seem to get peanut butter out of my brain. Here are my favorite things about this bar. The crumbly peanut butter top gets a little extra brown. You just cannot beat the taste of a peanut butter cookie or bar that has been baked until a little extra brown. The second thing is there the perfect amount of cheesecake filling in the center. It’s ridiculous. I shall give myself a little pat on the back. Preheat oven to 350 degrees. Line a 11x7 pan with heavy duty tin foil. Spray with non-stick cooking spray. In a large mixing bowl, add in the butter and peanut butter. Mix until combined. Add in the brown and granulated sugars and beat until light and fluffy. It will take 2 minutes. Scrape down the sides. Add in the egg and vanilla. Mix on medium until the egg is incorporated. Scrape down the sides. Add the flour, baking soda, and salt into the butter mixture. Mix on low until the dough forms a ball. Turn on high and beat for another 20 seconds. Set aside. In a large bowl, add in the cream cheese and sugar. Mix on medium until light and fluffy. Scrape down the sides. Add in the egg and vanilla and beat on medium until incorporated. Scrape down the sides. Add in the coconut and stir until incorporated. Add half of the cookie dough into the bottom of the pan. Press it out so it reaches all the edges and is even. Spread the cheesecake mixture to the top of the cookie dough. Spread it out so it's even and touches the edges. Sprinkle the remaining cookie dough on top. I placed bits all over and made sure I covered the edges. The pan will be super full, but won't overflow. Place in the oven and bake for 30 minutes. Remove from the oven and let cool. Chill in the fridge 2 -3 hours before cutting. The tin foil will allow the bars to be easily pulled out of the pan to cut and serve. We’ve had so many readers want to join us that we’ve started a peanut butter sharing group for all! Join us at The Peanut Butter Recipe Box on Facebook. Bloggers, do you want to join in on the peanut butter bash fun? If so, email me at [email protected] and request to join the Peanut Butter Bash facebook group! The first Thursday of each month we post a dessert/sweet with peanut butter and a mystery ingredient. This month’s ingredients were peanut butter and coconut. Here are the other peanut butter and coconut creations! Delicious! I want these now. 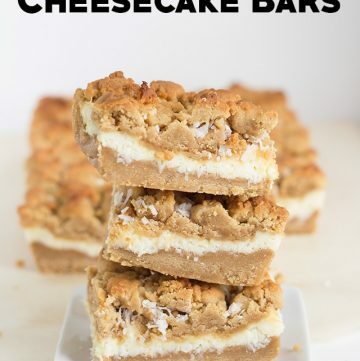 Seriously… Peanut Butter and Cheesecake are my two favorite things! What an amazing combination. That looks delicious! 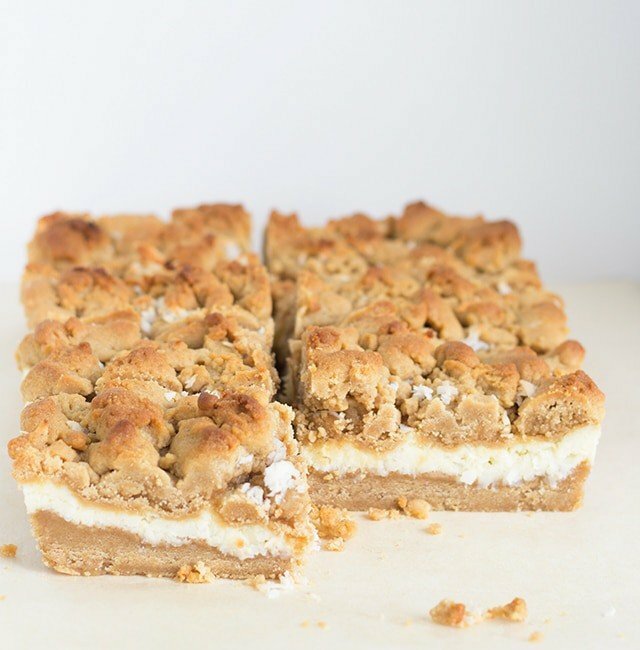 Hello, I´ve just found your blog and since I love peanut butter, I could not resist to look at this recipe. I have a question regarding the vaniila you´re using in this recipe. Do you mean extract, paste or powder? Thank you. I can´t wait to try them. Merry Christmas and good evening! I am very new to baking…highly amateur at best! 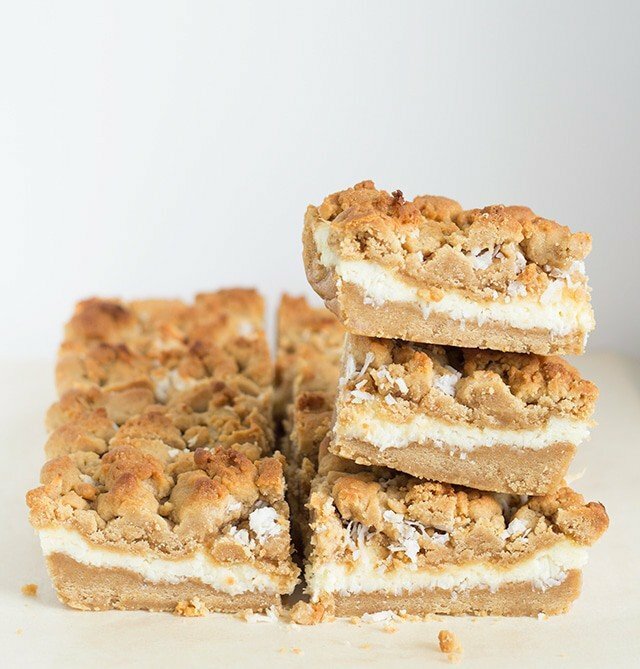 But this…THIS recipe was beyond what I thought they’d taste like and tomorrow the 25th I will be PROUD when I serve these two my small family for Christmas Dessert! I followed every step and found that the taste was just so what I’ve never tasted before, if that even makes any sense! Well, I just wanted to say THANK YOU and MERRY CHRISTMAS to you and your family. I thank you for sharing this wonderfully delicious recipe and I look forward to making it, and making sure credit comes back to your blog!